Home » belgium » border » cafe » netherland » There is a cafe on the borderline between Netherland and Belgium. There is a cafe on the borderline between Netherland and Belgium. Baarle-Nassau and Baarle-Hertog are two municipalities that divide the town of Baarle on the border between the Netherlands and Belgium. Baarle-Nassau is located in southern Netherlands in the North Brabant province and Baarle-Hertog is located in the Belgian province of Antwerp. 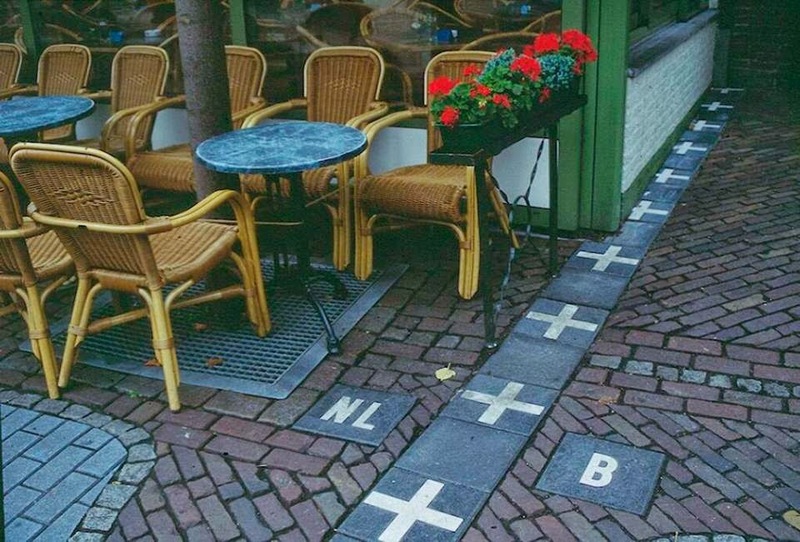 Both towns share a common border, but the international border that separates the Belgian town of Baarle-Hertog from the Dutch town of Baarle-Nassau does not run straight. It is not even curved. Instead, there are 26 separate pieces of land – little bits of Belgium and Netherlands scattered around Baarle. There is a main piece called Zondereigen located north of the Belgian town of Merksplas, and 22 Belgian exclaves in the Netherlands and three more pieces on the Dutch-Belgian border. Within the largest Belgian exclave there are also six Dutch exclaves, one within the second-largest, and an eighth within Zondereigen. The border is marked with white crosses on the pavement and metal studs in the road, and it zig-zags its way across the town paying no heed to houses, gardens and streets. One line enters a block via a gift shop then comes out of the back of a supermarket. Many homes are cut in half by the border, so as a matter of convention each household's nationality is determined by the location of its front door. If the border runs through the street door, the two parts then belong in different states, and this is indicated by two street numbers on the building. The towns attract a lot of tourists. For many years the shops in Belgium were open on Sundays, those in the Netherlands not – with the exception of those in Baarle. Taxes in Belgium and The Netherlands differed sometimes a lot, so one could go shopping between two tax-regimes in one single street. There was a time when according to Dutch laws restaurants had to close earlier. For some restaurants on the border it meant that the clients simply had to change their tables to the Belgian side. With the coming of the European Union, however, some of those differences disappeared. Baarle-Hertog and Baarle-Nassau’s bizarre geography results from a number of equally complex medieval treaties, agreements, land-swaps and sales between the Lords of Breda and the Dukes of Brabant that can be traced back to the 12th century. After the split between the Netherlands and Belgium was finally settled in 1839, there was a need to determine the border. It took three border commissions to sort out the issues. The last one fixed a 36 km stretch and was completed only recently in 1995.